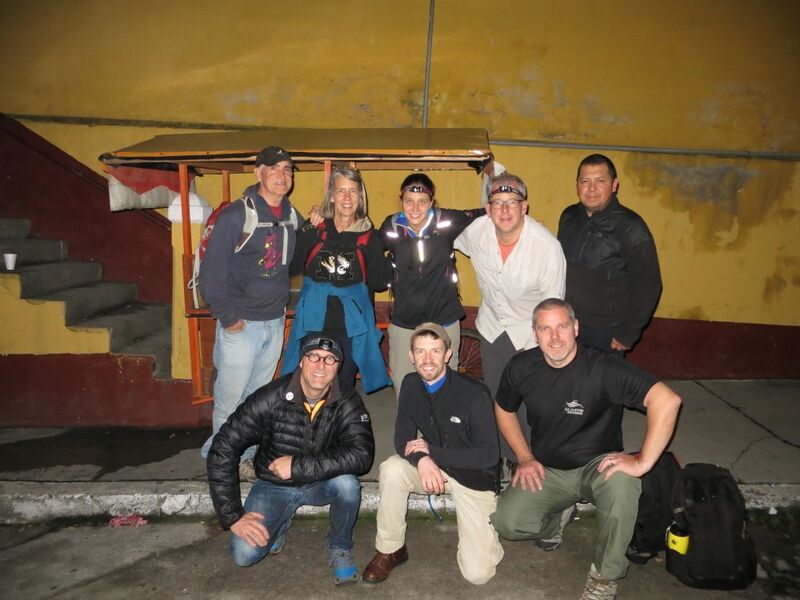 In Quetzaltenango, we met up with Hansy near the stadium and his friend wowed us with a story of Hansy’s record ascent of the mountain (an incredible 45 minutes). Then we drove over to the central park where a van pulled up at about 12:30 a.m., and we headed out to the Santa Maria Summit Trail trailhead which ended up being quite a long ways from the foot of the mountain but, unless you’re on dirt bikes, that’s as close as you can get in a van. It was overcast but we could see the moon starting to peak out of the clouds. Yes! We were about to do what I’d been waiting two year to do! 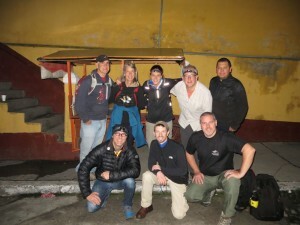 On the outskirts of Quetzaltenango, we bounced to a stop in the crowed van and excitedly piled out. While we couldn’t see the volcano in the distance, we knew that we’d soon be clambering up it’s slopes to see the sunrise. It was about 1:10 when we prayed together and then began our ascent with a few instructions from Hansy. We picked partners to keep an eye out for each other and then we started off on the trail with Hansy in the lead. 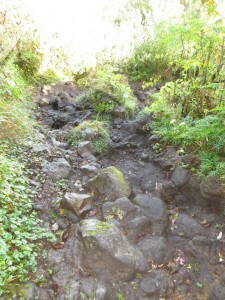 Hansy said the whole volcano is a reserve held by the government but the trails are not really maintained or anything. There was an abundance of trash and graffiti all the way to the top. 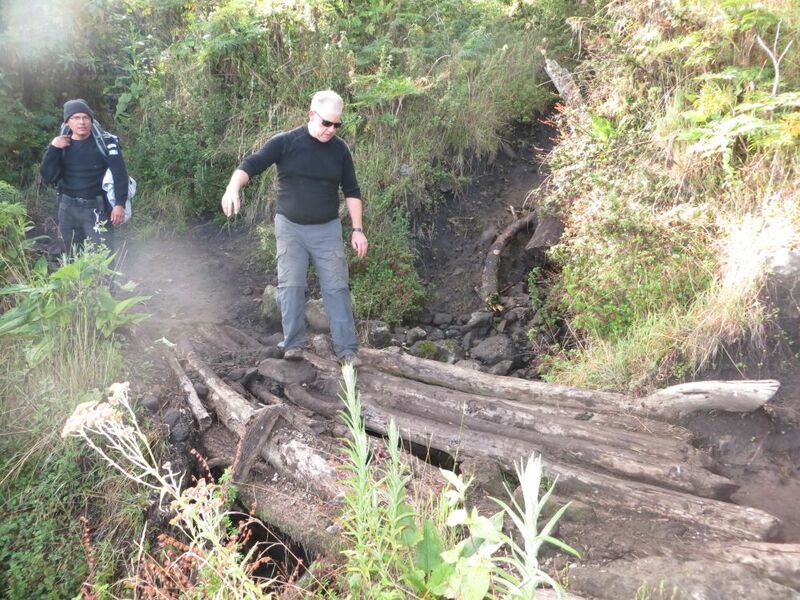 The trail was a gentle slope with rough footpaths made by dirt bikes, hikers and pack horses that the locals use to haul firewood out of the hills. Some areas require high stepping and steady footing over rough rocks, but it’s pretty easily managed. We were moving at a gentle pace. For all of us this was higher elevation than we were used to especially in the middle of the night. 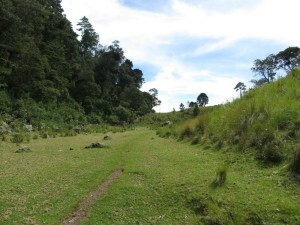 At about 2:45 a.m. we arrived at La Mesa, a grassy meadow that we couldn’t really see (the photo is from when we came back down.). At La Mesa we rested for about 10 minutes before heading onward. Notice in the photo that I was already wearing mutiple layers as the air was chilly, and I was anticipating the freezing winds of the summit. Here I am as we leave La Mesa and begin our ascent of Santa Maria. Due to clouds and darkness, we couldn’t see the volcano looming above us. 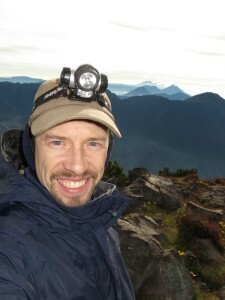 I was a bit surprised when Hansy let us know that we had just arrived at the halfway point for the entire hike. This was after we had already been hiking for nearly 2 hours. He told us that La Mesa was the point where we actually were at the volcano. Now were about to start our way up. 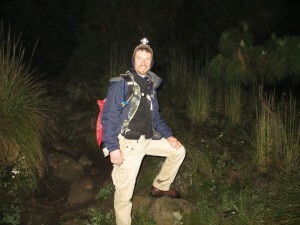 I think some of us were already feeling the strain of hiking through the middle of the night so these words were not the most encouraging, but we pressed onward and upward. 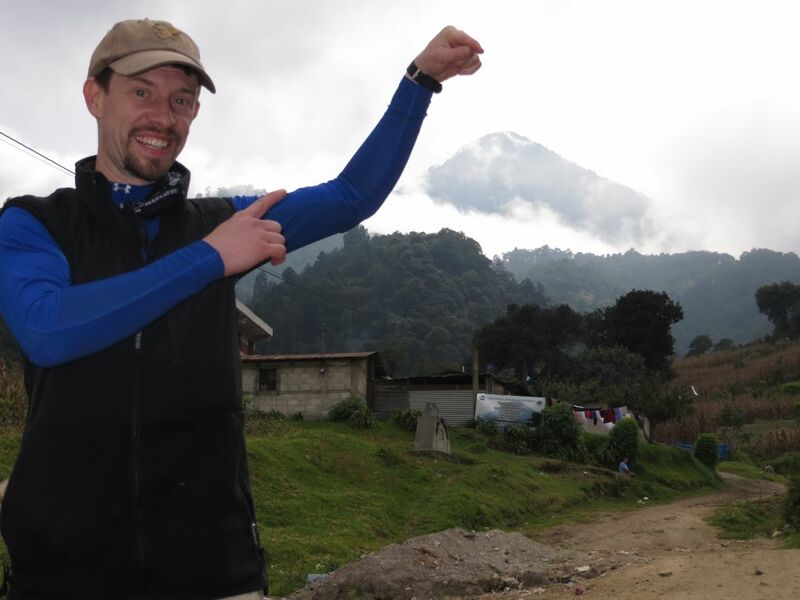 Not being able to see the volcano looming above us made it hard to imagine that we were only now starting to climb. 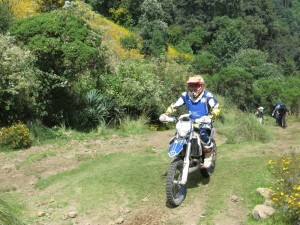 Leaving La Mesa we quickly faced rougher terrain on the trails. 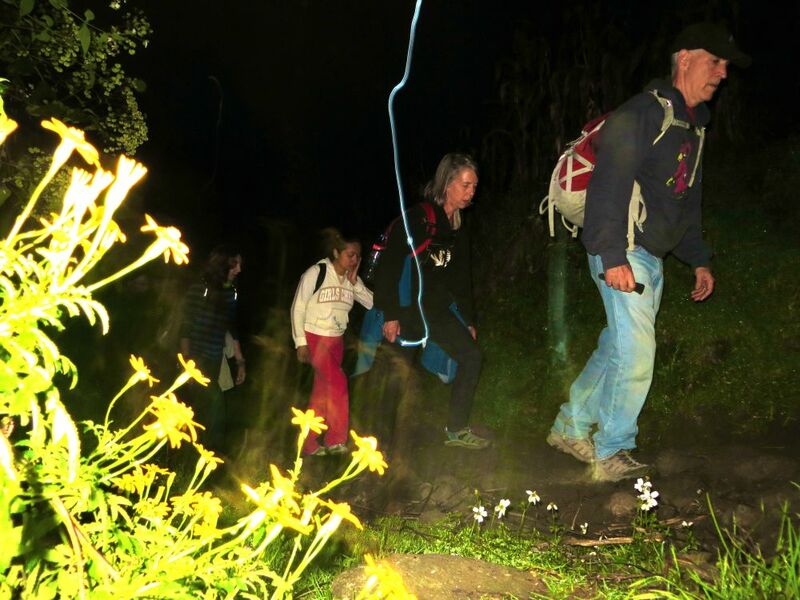 Slippery rocks and muddy trails kept us on our toes as dewy plants glistened in our headlamps. The forest around us embraced us with heavy underbrush and trees that only let the dim moonlight through in places. 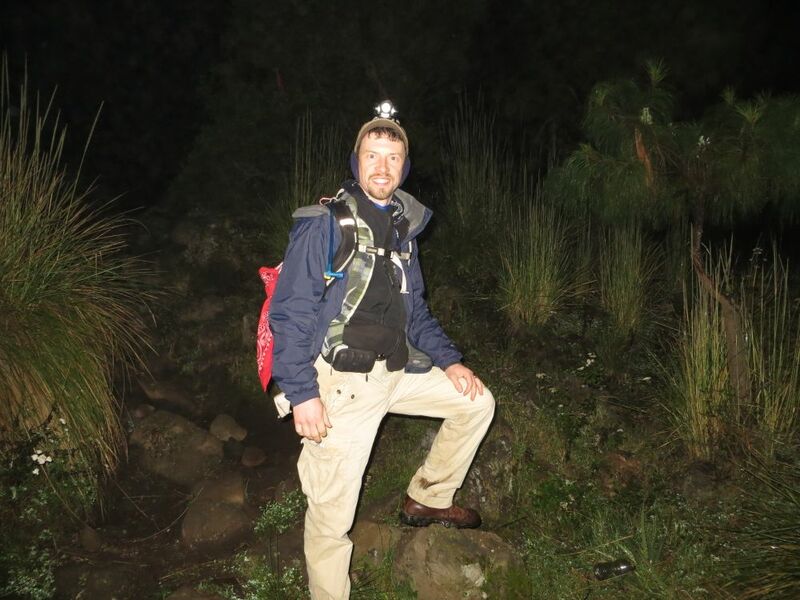 While previously some of us turned our lights off and walked by moonlight, now lights were pretty much required as we walked single-file up the rocky trail. While it was chilly, we were working up our own body heat in the climb and were grateful not to be facing the heat of the day as we climbed. 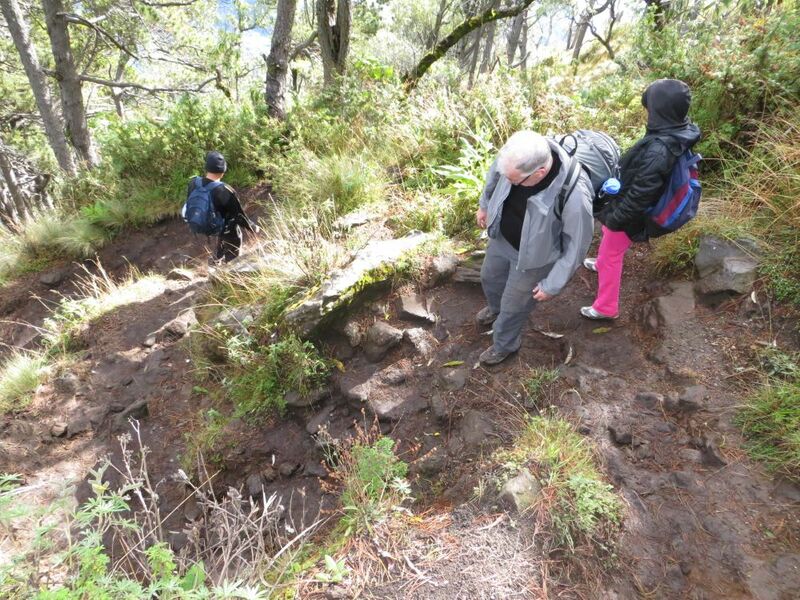 We were moving slowly because of the terrain and to keep from spreading our group out too much on the trail. At some point we arrived at “The bridge” it’s really just a handful of logs thrown over a ravine to make crossing easier. Though one needs to be careful when crossing because the logs aren’t really stable and one of our party slipped on her muddy boot and was down to her thigh between the logs when we were coming back down. Hansy said that the bridge marked the half-way point to the summit. He told us that (adjusting for our current speed) we were probably about 3 hours from the top. Hansy did his best to pace the group to beat the sunrise to the peak, but we were moving slowly. About 30 minutes or so after we left the bridge, someone asked Hansy for an ETA and he said we were probably still about 3 hours away. I think our pace was slowing. At 4 a.m. we discussed the plan to split into two groups (a slow group and a fast group) but the police officers strongly recommend against dividing the group because they wouldn’t be able to protect us. They said that groups of even up to six people had been “attacked” by thieves in the past. Since I had planned the trip, I made the executive decision that we should stick together for safety. I don’t know that everyone was happy about this, but they all went along with it. I knew that this meant that we wouldn’t see the sunrise from the summit, which had been one of my goals, but I’d already realized that that wasn’t going to happen at the rate we were going. I think if we had known that we wouldn’t be able to divide into two groups before we left, we would have planned it differently so that we could. We put the group that had been in the back in the front and let them set the pace so we weren’t so spread out. 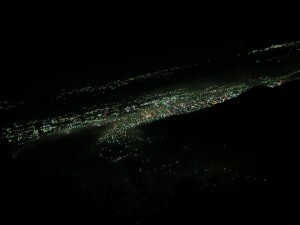 The city lights of Quetzaltenango. Somewhere between the bridge and the summit my legs began having cramps from high stepping up rocks and tree roots. I’d been able to walk them off but they kept getting worse. While I don’t consider myself unfit, I certainly should have done more to prepare for this climb than I did. I now have new motivation to find some workout plan to get myself in better shape. I found myself slowing down and having to stop more often. Erin, the physical therapist who was with us, recommended eating something salty and drinking more water. I tried to eat more of my peanut trail mix and drink more water, but it still hurt to climb and the cramps got worse. While a bit disappointed with my legs and feeling exhausted, I was grateful to my fellow climbers that encouraged me and checked in to see how I was doing. We were now high enough to see some great views of the city lights spreading out below us. These views were encouraging and urged us onward for greater vistas. Sunrise burns the eastern sky. At about 5:30 a.m., I started seeing the glow of sunrise lighting up the eastern sky. We kept climbing and gained on the summit. While we didn’t make it there in time to see the sunrise, we were on the north by northeast side of the volcano and had a beautiful view of distant peaks silhouetted against the sunrise. 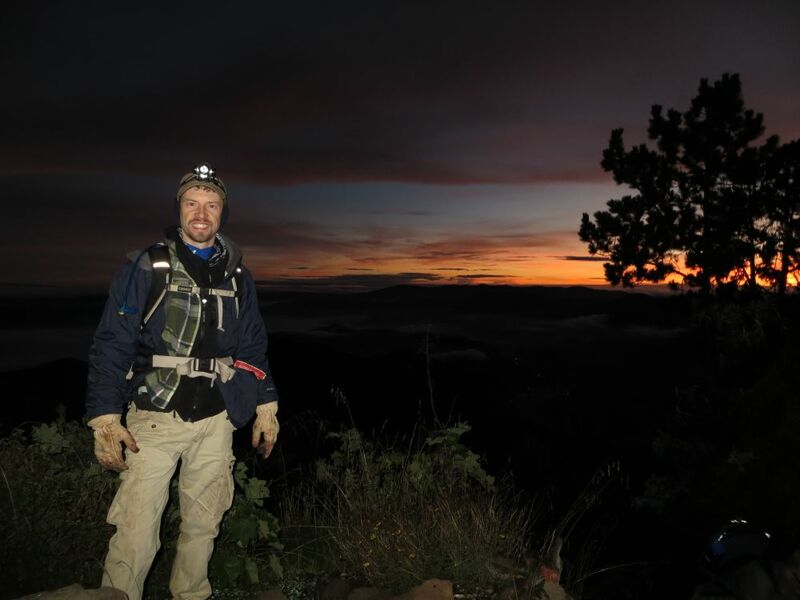 The sun rose at about 5:50 a.m. We soon were able to turn off our lamps as the sky lit up the trail in front of us. Now that it was light out, we were naturally spreading out more on the trail, at about 6 a.m. a group of young boys passed us with their dogs. I asked them what time they started and they said 3 a.m. 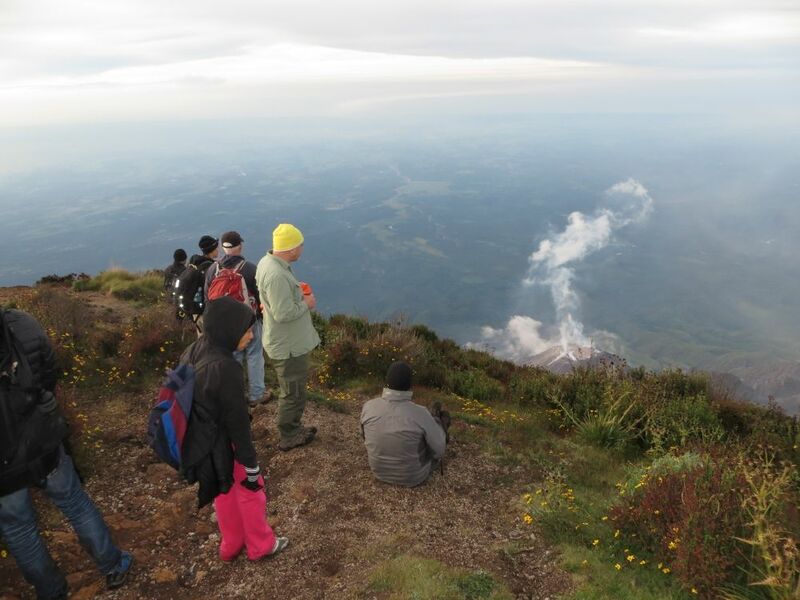 These Guatemalan kids who live at high altitudes were smoking us by two hours! We took heart and kept going! 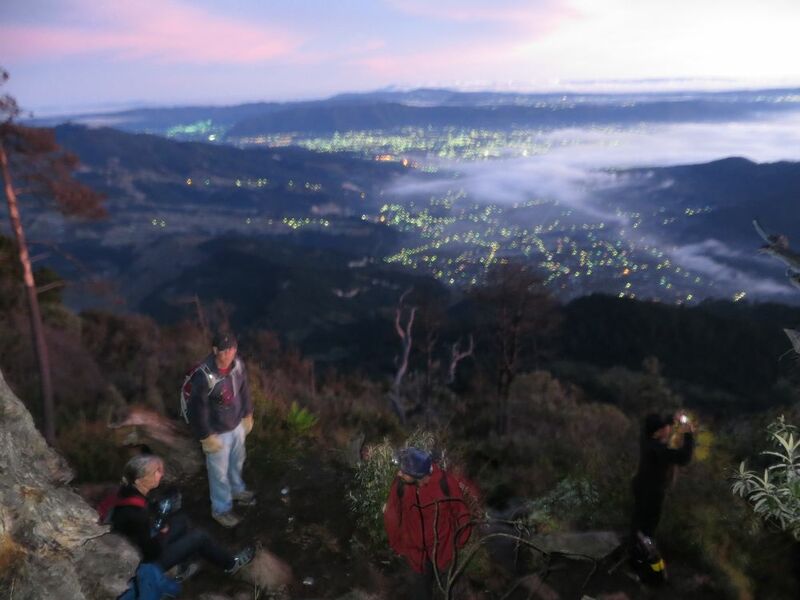 Morning fog and hikers over Quetzaltenango. My legs finally started feeling better, but I was still going slow as we started seeing the trees thin out as we reached the tree line. My team mates cheered me on, telling me I just passed the last tree before reaching the summit. My hands were cold in my leather work gloves (I couldn’t find any warm knit gloves so I had grabbed my leather work gloves before leaving for the trip. ), but I used them to stabilize myself and pull myself up the high steps and boulders. Victory! 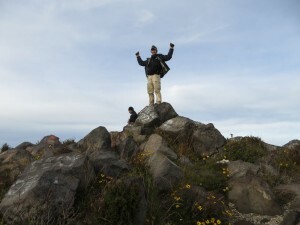 On top of the tippy top boulder at the summit of the Santa Maria Volcano! At about 6:50 a.m. we reached the summit. A few of us bounced to the top of the mountain with extra energy, but I, for one, pulled myself up the last rocks, praying for strength, exhausted, and very glad to have made it. What we’d expected to be a four hour hike turned into a six hour grueling climb. I’m still not sure why it took so long except that some of the group started out at a quick pace that drained them, and we ended up going slowly before we even reached La Mesa. So as a group, we started the more intense climbing worn down and moving slowly. I consider myself at fault as well for not being better prepared for this hike. Twelve thousand three hundred feet is pretty high for this farm boy who grew up at about 600 feet above sea level. I should have been working out for those two years instead of just dreaming of the fun this hike would be. Looking out over the vast land and mountains in the distance would have been breathtaking had my breath not already been taken by the climb. It was also breezy and cold. The east wind had a bite to it, and I’m glad I had my rain coat to use as a windbreaker over my layers of shirts. I looked around at the summit and spied the tallest point (a large boulder that has sadly become the medium of many graffiti artists), climbing atop, I had my photo taken to remember that I had made it! Being on top of the visible world like that was pretty amazing. The only things higher than us at that moment were the sky and Tajumulco, the tallest volcano in Central America, in the northeastern distance. We hiked down a small slope to the south and could view the crater of Santiaguito seeping steam. While we were at the summit, Santiaguito belched a cloud of ash into the sky. We were delighted to see a live volcano in action! We had started the nearly 6.21 mile hike at about 8,202 feet. and then went up to 12,375 feet. It took us six hours, and it was worth it! After some snacks and breakfast, we relaxed on the peak for about an hour and then began the trek downward. It was nice to see the trail in the daylight. Despite one of the guys having a twisted ankle, we were able to descend slowly but safely. When we crossed the bridge one of the girls fell through the bridge (as mentioned earlier) but she survived with a bump on her knee. As we gathered at La Mesa, Hansy said we could rest so we did, most of us fell asleep on the grass to the buzzing of bees in the meadow. I slept between a half hour and an hour and awoke refreshed. That was exactly what my body needed! Dodging dirt bikes that were racing the trail as we descended. 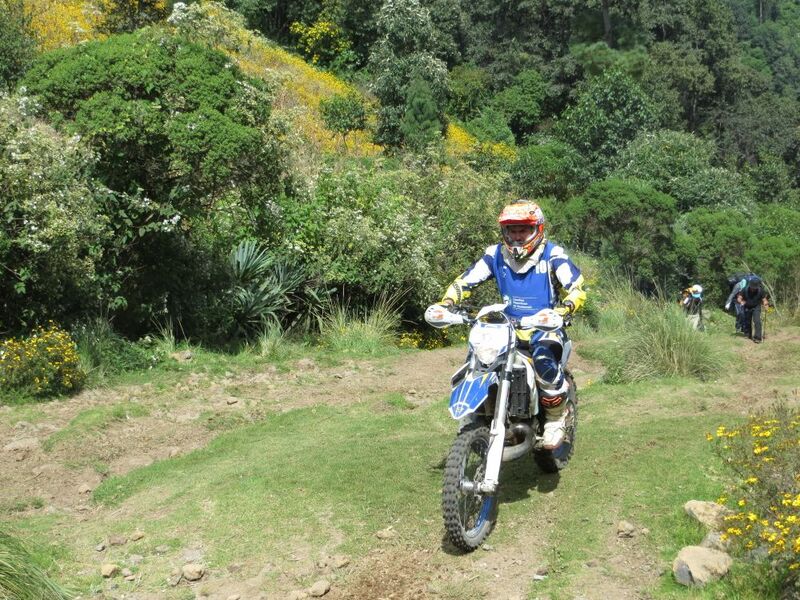 We headed on out to the trailhead dodging dirt bikes that were zipping up the trail in a race. This slowed some of the hikers down as they had to wait for the bikers to pass. We finally all arrived back at the waiting van at 1 p.m. It was almost exactly 12 hours after we had left the night before. We gathered up a special tip for the police officers and Hansy for their patience with us and helpfulness. The police officers were not just along for security but they also helped carry the backpack for the guy who hurt his ankle. From the trailhead pointing out where we were on the summit! I can honestly say that as I drove back from Quetzaltenango with people resting in the back, that I figured that that hike was a once-in-a-life-time experience for me. Not only because it was amazing, but because I wasn’t sure that I’d like to do it again. After getting a good night’s rest, I can say that I not only enjoyed the hike, but I could do it again. I’d definitely prepare myself better physically before my next ascent of this volcano. to use on the summit. 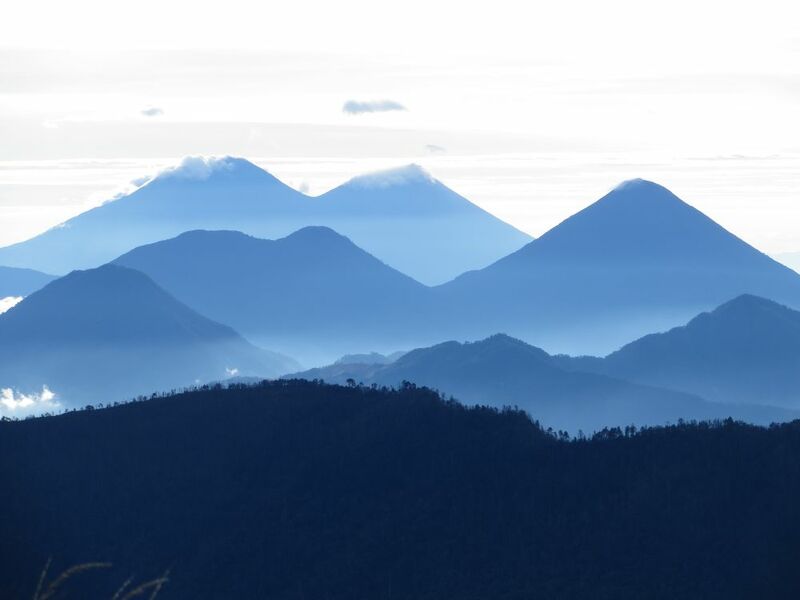 This entry was posted in Guatemala, Nature, Reviews, Travel and tagged adventure, Guatemala, hiking, mountian, Quetzaltenango, Santa Maria, travel, volcano, Xela by michaelshead. Bookmark the permalink.